I had multiple non-Japanese people asking me about social games in Japan, so I'd like to summarize some of the stuff I saw recently. 2011 was the year of social games in the Japanese game industry. According to this article on Diamond "Why Nintendo will not do social games(JP)", many game companies such as Square Enix, Bandai Namco and Konami were "rescued" by the rise of social games that were operated by mobile social network/game platform companies like DeNA(JP) and GREE(JP). 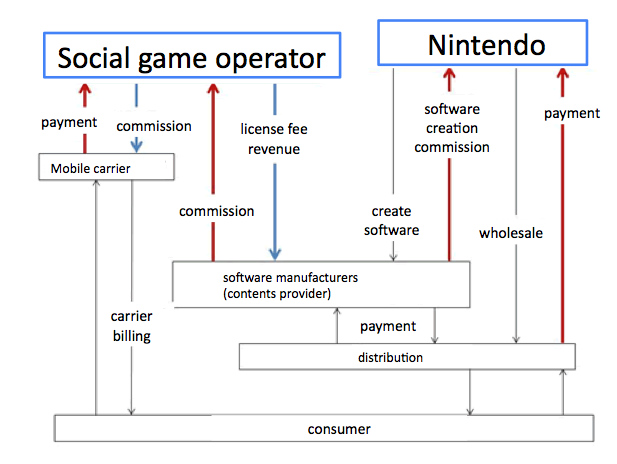 On the other hand, there are companies like Nintendo that is not entering the social game business. Nintendo's CEO Mr. Iwata says "charging users by changing some number parameters and making them open some key or making something advantageous is not charging for creative efforts" and that "you might get short term revenue but cannot build long term relationships with customers" and that "Nintendo should not do such thing". On the other hand, it is true that companies like DeNA and GREE are making a successful business- if you compare Zynga and GREE, active user (used the service at least once a month) of Zynga is 227 million whereas GREE's registered user is only has 10% of that- 27 million users (update: GREE does not publicize number of active users but apparently less than 27 million- thank you for the info, @serkantoto! ), but the net operating profit of Zynga 2011 was 630 million USD whereas GREE's prediction for 2011 June-2012 June is 900 million USD according to Sankei Biz. Also, their business success is not only for themselves but for various companies and industries surrounding them, and many people advises Nintendo to enter social game business as well. For example, GREE sees its operating profits rise 300% to hit a record $910 million profits, and their sales for the final quarter of 2011 alone may be $520 million. GREE invested in a startup that creates social games called "Gumi" and has 20% stake of the company. Gumi Raised $26 million, and sold more than $50 million worth of virtual in-game coins last year. Those revenue are split with partners including carriers and platform providers like GREE- so that's how the business ecosystem works. 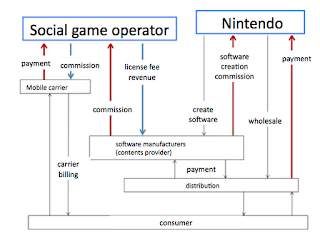 This is a diagram explained in Diamond's article above- left is social game business model which circulates revenue to mobile carriers and content providers (blue arrows) whereas package game business model does not have. It is also true that we are starting to see troubles in online games and Consumer Affairs Agency is investigating the expensive bills(JP). Consumer Affairs Agency's press release on this issue can be found here(JP). Criticisms toward Online game companies is that they attracts users saying their games are "free", and charges later on the items. Children gets heated up by those services, some reports in the article above includes "My son who is elementary school student bought 300yen (4USD) lottery 100 times" and "My child is 5 years old, and bought an item for 100,000yen (1,300USD)", asking the platform providers to pay back the bills. According to another article, one of the game manufacturers says 80% of the users play social games for free, and less than 20% pays. Within those who pay, some pay more than 2million yen (26k USD). Of course that doesn't happen in a day. They start by paying 50 yen, 100 yen, 500... and whey you pay 1,000yen you have no trouble paying 2,000. You might want to ask "what are they paying for?". According to Prof. Miho Nojima, "They are paying for their existence in the in-game community, to keep their friends there." The article introduces a jobless man living on social welfare, but is paying around 20,000 yen per month (2.6kUSD) to stay in this in-game community. "Not everyone can be successful or admired in the real world. Human beings wants to be admired, and are willing to pay to be admired. In the 1980's during the bubble economy, people paid for expensive brand bags to satisfy their pride. Now, that is happening inside social games." When you don't receive the word "Thank you" from anyone in the real world, they go out and "help" someone by a "click", and you get admiration, gratitude and are able to satisfy their pride, even if it means paying some money. You don't get that in package games, this only happens in social games.